Afra, having ascended many years ago, is the ascended master patron of Africa and represents unity and the true understanding of universal brotherhood. His teachings if embraced by the people of the earth would truly cause a spiritual awakening. Once long ago, a golden-age civilization of the Blue and Violet Races lived in Africa. At a certain point, dark souls among the people sought to drive a wedge into the established culture of harmony. Peace was overturned and the stage was set for the downward spiraling of this civilization. The basic sanities and civilities of life were eventually lost as brother warred against brother. From the realms of Spirit, a Great Soul saw the plight of the Blue and Violet Races and sought entrée into the earth in order to help. Cosmic councils governing the destinies of nations granted this compassionate individual the opportunity to embody on the continent of Africa to teach by example the way to dissolve conflict through the sacred fires of Brotherhood. He traveled extensively, filling the ethers everywhere with the memory-traces of Unity. He was the living spirit of brotherhood in embodiment at the time, descending from realms of Spirit to save Africa from self-destruction. His message of “we are brethren” hallowed the space through which he passed and charged the atoms of man and nature with an energy field that contributed to the spiritual awakening of all within the proximity of his divine aura. Afra’s emanation of love is a universal solvent for all conflicts between peoples, organizations and nations, or any disturbances on the delicate web of life. Like the universal Tao, the Chi of Brotherhood flows through the ten thousand things. * Only harmony and unity can exist between people when Afra's presence is invoked, and his holy reverence for each soul is perceived, accepted and permitted to flow. There can be no duality, no “us versus them,” only the harmony of Afra’s Spirit of Brotherhood. *"Ten thousand things", a concept from the Tao Te Ching by Lao Tzu, is a metaphor for infinity. In April of 2005, the ascended master Afra spoke through the messenger, David Christopher Lewis, to a small group of devotees in Detroit regarding the possibility of resolving conflict—whether within a city or among nations—by embracing the spirit of brotherhood. His message also suggested that the people of the Blue and Violet Races (people with links to Africa) have special gifts to share with other races that will be invaluable for this resolution. The themes of Afra’s messages have always been to live and breathe in the light of brotherhood, and to love one another. He asks us, as followers of the ascended masters, to lead the way in spreading brotherhood throughout the world. 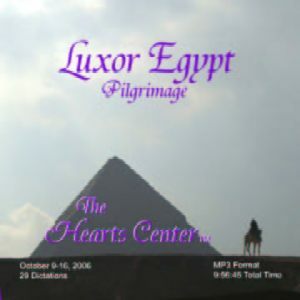 In October of 2006 during a pilgrimage to Luxor, Egypt, Hearts Center pilgrims heard Afra and other ascended masters calling for a more active effort to bring violet-fire prayers to the African continent. Afra and the masters told of the struggle of the people of this land. They requested that those who resonate with the souls in Africa come together and pledge to be the light—the violet fire—to heal this continent through their daily prayers. Records of human discord throughout Africa can be transmuted by those willing to commit themselves to coming together regularly for prayer to assist the masters in consuming these records. Since that trip to Egypt, a group of ascended-master students have engaged in internet prayer vigils for the healing of Africa. Prayers are now being offered weekly to lift the people of Africa from a tumultuous path and to bring new possibilities to the continent. Through these vigils, we dedicate our energy, assisting the ascended masters and the angels in the elevation of Africa to a continent of only light, only the Spirit of Brotherhood. As we heal Africa, we heal the world! Great Afra Quotes to Read and Share! Engage in spiritual self-assessment, seeing clearly where you are on the path as you move forward, ever forward. Resolve those elements and energy patterns within that you still find troubling in your world—those which stir up situations, especially in the way in which you communicate and interact with others. Burn through! O sacred fire of true brotherhood. Blessed ones, you have understood the necessity, even the God-requirement, that all come into the state of readiness within, whereby the light can be accepted fully,li within the holy temple of being. And when you accommodate God's Light within you, in this way, there is the sanctification of all, there is the ennoblement of the spirit within your experience of life; all becomes brightened, illumined, energized, vivified in, the Great God Presence, of eternality. "Watch the words that you speak. And empower those that you do speak with cosmic intent, and your plans may become reality sooner than you think." I AM Afra and this day I offer my heart, to those who would be instruments for the sacred flame of brotherhood; whereby hearts, united, may stand for the holy purpose of bringing in a new way of light, a new age of freedom. If unity is to manifest upon the earth, then it must come to the hearts of those who understand the true nature of brotherhood which is always to serve and to grow in the spirit each day through acceptance of all as worthy and capable and acceptable. There is an arc of light from a sacred foci on the altar of the Most High God in the Great Central Sun. And that light is arced to every heart through the I AM God Presence, which is the individualized Higher Self of each one. Within your heart you may have an arc of that covenant. Covenant being a word that connotes a sacred bond between souls and their God. The sacred bond of God to you is this connection through your crystal cord of your soul with your Solar Presence. I see a new world dawning, an age of perfection, whereby everyone may live free in the sure knowledge that their souls are valued, that their lives have meaning and that nothing can take from them this inherent God-essence that is their right to experience and to know. If you would be a movement of light to the earth and if all are to embrace this teaching of the ascended masters and of Saint Germain and Portia, you must have a greater fire of joy and of vitality and of abundance and grace in your world. And this will come through your invocation to the violet light, blessed hearts. Therefore, set the seal upon the Seventh Age, even as the master of Aquarius comes opening the seventh seal and revealing greater revelation of light to mankind through the teachings of divine alchemy, of precipitation and of cosmic joy. Let the frequencies of freedomflowthrough your heart and soul and mind and spirit! And let all mankind know the equivalency of the divine world here below because you have decided that you will be anchor points in the earth for that light of the heaven world, blessed hearts. The Scriptures have spoken, "Holiness unto the Lord. "1And that is what I offer to you this day. Whatever level of holiness that I have embodied, that God has vouchsafed to me within my soul, I extend it to you so that you may always know and feel and realize that you, too, are holy. Your soul is wholly God’s, is wholly mine.Though I would not possess you, I would emanate through you. Yes, I compel you to ascend daily, hourly, every moment. Yet, be patient with yourself in this process and know that God is that compelling force that lifts you up on angels’ wings and guides you to the throne, the three-in-one, of his divinity in beingness. Love begins in Ghana, in Accra, as the heart chakra. And we can see all the rivers, the mighty rivers of Africa, as tributaries of the heart of Afra.We can see the Congo River,the Zambezi, the Nile and all of Africa's riversas veins of light through which Afra’s love flows out to all.So we see our hearts bonded with Afra’s and the love flowing and continuing to issue forth to feed the spiritual requirements of all light bearers and all peoples upon the entire continent. Greetings, everyone. Afra is here and extends his heart to each one of you.The extension of his heart is conveyed with a sacred motion,a movement of his hand,the right hand, from his heart to his head as he bows to the Christ, the Buddha within you—very similar to the Salām (1) that is offered as a sign of peace, brotherhood to those that we newly meet or friends of old. In this conveyance, Afra is extending a light of acceleration of freedom’s fire and of soulfulness.For he has drawn from within his soul a very high vibration of cosmic soulfulness,which he blends with the resource of his heart-centeredness and his love for humanity,and extends it and shines it forth to us and through us,because each of us represents an entire sector of society within our earth. Each of us represents, really, a people and a portion of an evolution of lightbearers. This extension of his heart and his soulfulness is a blessing, is a boon and it is meant for us to accelerate consciousness so that we in turn can follow his lead and bring the Salām and the flame of peace everywhere we walk. "Afra represents brotherhood and freedom, these are the two preeminent God-Virtues or qualities that Afra represents...And he is a proponent of the freedom of the soul, the freedom of the entire being, through divine love; and love is the highest virtue in the universe. Love is what holds everything together, Afra is the epitome of love; pure, virtuous, unadulterated God-Love, which includes brotherly love, sisterly love, love of everything, love of every person…equally, without discrimination or judgement." Many of you have sought, in some way or another, a personal relationship with one or more ascended masters. Blessed ones, this is a noble and pure God-desire, for when you communicate with us, there is a bridge created in a number of dimensional planes of being because you offer the essence of who you are in this process. Your soul is a stage, upon which your heart dances. Your mind is free, your eyes catch the glimpses of the divine one that move you ever higher in spirals of light; in your freedom to be who you are. The soul that is unshackled, in its freedom, knows eternality! Others may imprison your body, yet they may never ensnare your soul when you are in love with God. How you treat your children will determine the future of civilization. It is very simple, beloved ones. This is not rocket science. How you value their time, their energies, their contribution will determine what your world will look like. So if you would see a better society, then put your energies, your money into divine education working with your children, your youth creating greater opportunities for their Self-development and nurturing and training for worthy jobs and for each one to be a recognized and accepted citizen within the realm. Looking to the future requires you to deal in the present with a reality of giving your all for the young who will far transcend you if you allow them to grow fully as they should. Prepare the environment, as Montessori has said. I call this day for the raising of the consciousness of mankind through the outpicturing in the media of higher values, ascended master principles of light and the example of true heroism that must come forth in the motion picture industries and films for youth. For the examples you see of violence and decadence in all manner of horror and deprivation is simply abominable in the eyes of ascended hosts and angels who weep when they see how these transmissions affect the consciousness of the people, especially the impressionable minds of your children. Afra: Engage in spiritual Ho'oponopono. Work on yourself as if you were that person, that youth. Hold pictures of these in your mind's eye as you go deep within yourself and realize your oneness with all life and work that change that you would see within society within the crucible of your own being at the deepest and core level. Root out any possible elements of darkness within yourself. The more light that you can carry, the more you can be a point of atonement for the sins of the world, the karma of those who are ignorant of what they do. Long, long ago I determined to in some way help my brothers and sisters who lived in darkness. And though I attempted time and time again to dissuade them from their evil ways, the voice of God spoke within my heart and said, “Afra, know thyself.” And therefore, I determined to do so. And I worked and worked and worked to uproot every point of discord, inharmony and darkness within me until I was fully light. If I had not done this in that hour, I would not be speaking with you today, and you would not have the benefits of this discourse of my heart and of the light that I bear the world. Your attention upon your Presence is the greatest boon to any alchemical endeavor; for love is at the center of the sacred formula that activates, energizes, nourishes and ultimately completes the alchemy, through a holy matrix of light, [which] that love supports and blesses. Reconceive yourself as God sees you if at any time a burden comes upon your being whereby you feel less than your highest Self. God has already forgiven you long ago for what you have not let go of or forgiven yourself [for], blessed ones. It is time to let go and to forgive self. All unworthiness must be surrendered and a new divine self-worth rise and suffuse itself through your entire being, emboldening you to act, even as Jesus did, proclaiming that he was one with the Father, a Son of God. Do you see how important each of you is when you come and participate in these weekly sessions? For the geometrization of the light through each one of your hearts, one with mine, is essential to this alchemy. And nary a one should miss these sessions except for very important personal emergencies or intense family requirements. Blessed ones, setting aside time with me to be with you allows me to fully employ the allness of my cosmic consciousness not only for you personally but for the entire continent of Africa and her people. This is our Brotherhood’s work and each of you was chosen and each of you has chosen to be a major part of it. You knew before you embodied that you would have access to my heart in this era, and I give it freely, my friends. Have you considered that you as a holy brother or sister can be the physical manifestation of my very heart where you are? [Audience responds, "Yes!"] I say that some of you have taken this not only as a possibility but as a reality. And, therefore, where you walk, I am. Where you speak, my voice echoes. And where your soul is stirred by the quickening of the Spirit, there my fire emanates and is manifest not only in your plane but in many dimensions of being. For God is limitless, is he not, in his ability to transform all, blessed ones? And if God, as the Eternal One, as the Fire-Enfolding-Itself, can enter your domain by the presence of who you are, then the very possibilities for world transmutation can increase. And one by one by one, when your soul is wed fully to the Spirit of your God Presence, then the true brotherhood that we all envision may fully manifest once and for all upon this Earth. I see your soul as a living reality and not just something that is a will-of-the-wisp or that which some speak that they have no true knowledge of. For I live within my soul presence. And that chakra, as the focal point of the violet light, can emanate such stupendous and magnificent light as the light of freedom, as the light of transubstantiation, of liberty, and of a sense of God-equality within all that when you embrace this level of soul-connectedness with the Spirit, you, too, resonating with me as a holy brother or sister, can, blessed ones, change the course of history itself. Question: Does anyone from the Afra group on the call have a question for beloved Afra? David: Afra is receding now and Jesus is stepping forth and lending the resource of his heart to Afra. He sees the resolution of conflicts upon the African continent as key to world peace. He is the Prince of Peace. And since Afra welcomed us with the sign of Salām, of peace, Jesus responded, and he is now also blessing us as ambassadors of peace and brotherhood. So on behalf of Afra we’re ambassadors of love; on behalf of Jesus we will be ambassadors of peace and brotherhood, which, as we know, are on the sixth ray. To have brotherhood, Jesus says, you have to have peace within you. To have true brotherhood on this earth, we have to have the mastery of our emotional body, the water within us, and have peace. And from that point of perfect peace, brotherhood flows. So that’s a very simple, quick teaching from the Prince of Peace to us, and it is important for us to consider in light of Hercules’ labor. By mastering our emotional body, our solar plexus and the flow of light through us, we achieve inner peace and project brotherhood to all. And we will only have that true brotherhood around the world when peace reigns supreme within the hearts and minds and lives of devotees. Greetings, everyone. Afra is here and extends his heart to each one of you. The extension of his heart is conveyed with a sacred motion, a movement of his hand, the right hand, from his heart to his head as he bows to the Christ, the Buddha within you—very similar to the Salām 1 that is offered as a sign of peace, brotherhood to those that we newly meet or friends of old. In this conveyance, Afra is extending a light of acceleration of freedom’s fire and of soulfulness. For he has drawn from within his soul a very high vibration of cosmic soulfulness, which he blends with the resource of his heart-centeredness and his love for humanity, and extends it and shines it forth to us and through us, because each of us represents an entire sector of society within our earth. Each of us represents, really, a people and a portion of an evolution of lightbearers. This extension of his heart and his soulfulness is a blessing, is a boon and it is meant for us to accelerate consciousness so that we in turn can follow his lead and bring the Salām and the flame of peace everywhere we walk. You have heard what has come forth in terms of the Twelve Angels of Unity who will embody upon the continent of Africa. In some ways blessed hearts it takes many cycles of your time for the fullness of cosmic change to occur within your world. Be patient and be at peace. Do not be anxious but hold the space of Cosmic Christ peace within your solar plexus. For often if there is even within you a certain agitation rather than perfect Christ peace and Buddhic peace then that point of agitation and emotional disturbance can lend itself toward a rupturing of the aura of your own nations and the planet because of the great light that flows through your awareness and consciousness and [the light] that you invoke. I know something about a golden-age civilization. For I was there in the Sahara with Saint Germain and did see the shining example of a virtuous leader whose every thought process was to extol the divine qualities of the Godhead within the earth itself. You have the keys to the kingdom, to the consciousness of God within you now. All that we have released through the dictations delivered through our various amanuenses in previous dispensations as well as this one have been for the purpose of reconnecting you such that you, as a dynamo of cosmic fire, may deliver to the earth that which is essential for the freedom of mankind. You know the dynamics of alchemy, for many of you are engaged in [alchemies] through a number of projects. Your attention upon your Presence is the greatest boon to any alchemical endeavor; for love is at the center of the sacred formula that activates, energizes, nourishes and ultimately completes the alchemy, through a holy matrix of light, [which] that love supports and blesses. Love begins in Ghana, in Accra, as the heart chakra. And we can see all the rivers, the mighty rivers of Africa, as tributaries of the heart of Afra. We can see the Congo River, the Zambezi, the Nile and all of Africa's rivers as veins of light through which Afra’s love flows out to all. We are all to be ambassadors of God-love, of the love of humanity, the love of all peoples, of all races, of all skin colors, of all generational traits. If I could convey one thing to each and every one of you to spread across the earth, it is this, that [all] son[s] and daughter[s] may be a spring of light and grace and hope to the world, so long as they open the tap for heaven’s flow to manifest in 3-D reality. Yes, we are active in heaven—more so than you may think. And the possibilities for the descent of heaven’s grace are everywhere in your realm, blessed hearts. Where you walk, heaven may descend through the soles of your feet, through your own solefulness. Ha-ha-ha! Therefore, discern how, only through greater God-power manifesting from deep within your soul, may you have access to quotients of fire from your God Presence and Sun Source that will deliver you as a soul into the very arms of your God. And since, through lack of attention upon your God, there is the cutting off of that flow and the severing of the light, then you see the power outages in the physical plane as well as the lack of connection between your soul and your spirit that has manifested outwardly as the fall and the decline of the true solar civilization that you now seek, blessed ones. Pray for one another. Bow to the light within each one when you greet each other upon entering your Hearts Centers, in your homes and even in your communications by email. Begin or end with, "I greet thee, O brother, O sister of light and bow before your divinity this day." You can be victorious when [by] true acceptance of your own divine nature, fully, you thereby are able to embrace each one as a co-equal in God's heart. I have proven the law of being through humility and through complete identification with the Creator, acceptance of that holy will and the free-will experience of life in this domain. You too, blessed hearts, through your free choice may live as God-free beings, embodying the highest essence of your Selfhood and thereby prov[ing] the reality of soulful living where you are. Even in moments of pain, sorrow or a sense of lack, instantly I will lift you up, do you see? [Audience responds, "Yes!"] Instantly, I can be in your auric field and I will compel you to ascend higher by your own God-desire to do so. This is not coercion as black magic. It is your free-will choice to call me into action and assist you by the grace of God, by the love of God, by the tryst of our hearts, by the energies of our souls. Many of you have sought, in some way or another, a personal relationship with one or more ascended masters. Blessed ones, this is a noble and pure God-desire, for when you communicate with us, there is a bridge created in a number of dimensional planes of being because you offer the essence of who you are in this process. And this bridge builds a golden highway of light over time through the continuation of your heart communication with us, whereby angels descend and souls of light ascend through this sacred bonding that has manifested by your loving intent. You have heard what has come forth in terms of the Twelve Angels of Unity who will embody upon the continent of Africa. In some ways blessed hearts it takes many cycles of your time for the fullness of cosmic change to occur within your world. Be patient and be at peace. Do not be anxious but hold the space of Cosmic Christ peace within your solar plexus. If a nation and a people and a civilization are to be saved, then some must make the supreme sacrifice. Will you be that one, blessed ones, who with Saint Germain and Portia will decide once and for all that every decision that you make, every act you take will move you toward the ultimate day of not only your own freedom but the freedom of mankind, I ask? [Audience responds, Yes!] Then, through approbation and through dispensation, I can go to the heart of the Karmic Board before their final meetings at the close of this year seeking greater dispensations of light for my people not only within America but upon the African continent. The principles of freedom are written in your soul. And you, each one, must discern how they can be applied in your life, in your work. When you understand the nature of freedom as a fire, then you can give unto all who discern its innate ability to change that which is unreal unto that which is immortal within all; giving it liberally, letting it shine, letting it flow. And thus the victory will be had because some have understood the equation of what is required in terms of sacrifice and givingness to make it a reality upon earth. You have heard what has come forth in terms of the Twelve Angels of Unity who will embody upon the continent of Africa. In some ways blessed hearts it takes many cycles of your time for the fullness of cosmic change to occur within your world. Be patient and be at peace. Do not be anxious but hold the space of Cosmic Christ peace within your solar plexus. For often if there is even within you a certain agitation rather than perfect Christ peace and Buddhic peace then that point of agitation and emotional disturbance can lend itself toward a rupturing of the aura of your own nations and the planet because of the great light that flows through your awareness and consciousness and [the light] that you invoke. Call to the Elohim Peace to sustain a greater action of this solar light of peace within these nations so that there can be stability, harmony and a resolution of all conflicts, that these political prisoners may be freed. Question: Beloved Ascended Master Afra, my questions were answered in the questions that you answered to Brother Blocton and Brother Stegall. We seemed to be going in the same direction. I just want to thank you for the realization that you, Saint Germain and all the masters are with me always. It gives me the strength and the determination to go on to the very end. Thank you. Afra: You're welcome. The very end—that is an interesting concept, for the end is only a new beginning also. Beloved heartfriend Alfred, there are many new beginnings in store for you. And we smile upon your soul for what will be occurring at many levels of your being throughout the remainder of this incarnation and your eternal pursuit of God. Your gratitude is felt and rings and sings within my being. I have seen you in the ring, and you did sing! Now there is a new circle of divine influence in store for you where the angels are singing ever a sweet lullaby of joy and freedom and brotherhood and are grateful to be in your presence, even as you are grateful to be in ours. Thank you. There is a child who has been born this day in the land of Africa who embodies the essence of freedom. Guard this child with your prayers, your love. For the destiny of my continent depends upon this one and everyone who upon earth would realize their highest soul faculties and the freedom to be love. I thank you. How great is God in manifestation in his sons and daughters upon Earth and in heaven! How great is the Universal Spirit of Brotherhood, of Sisterhood in the realms of light that binds the hearts of all true servitors of fire together as one! My God is compelling. He is compelling me higher, and I extend this invitation to you and compel you to ascend daily. The light of God is what compels us higher. Within that light is an action of such sublimity, love, brotherhood, transcendence that once we feel it within our soul, nothing can stand in the way of our ascent, my brothers and sisters. The soul of God is beautiful. Its essence stretches out across the galaxies, the entire cosmos and is felt by those who are sensitive to its reality, because they have opened up their consciousness to perceive this holy essence. When you tap into this universal soulfulness, your victory is assured because it moves you. There are in the earth a number of living Buddhas and even those who have ascended who have chosen to return to serve mankind. Who among you may be one of these? It may be the one sitting next to you. Or the one of whom you have gossiped in recent days for the seeming inconsistencies of their behavior in the outer. Judge not another for you do not know what spark of fire gleams within the breast of that one. Honor each one as the very flesh and blood of your own being and you will never criticize or condemn another again. Pilgrims journeyed to the Ascension Temple at Luxor with ascended masters Serapis and Morya. It was the journey of a lifetime for those who are determined to make their ascension! There were personal initiations conveyed on inner levels and souls were prepared for their ultimate reunion with God. Pilgrims visited the great pyramids at Giza, floated down the Nile, and walked where the Masters walked. Nearly 10 hours of 29 amazing dictations and six other presentations from the 2006 Luxor Pilgrimage. HeartStreams delivered during the pilgrimage. Pilgrims journeyed to Ghana, the heart chakra of Africa. The West African country that Sanat Kumara called “…an ascended master nation”1 to be instruments for the release of cosmic fields of transmutation, cosmic love and cosmic brotherhood. This was our third African pilgrimage, completing the merging of three anchor points of a special triangular grid that the masters desire to establish on the continent through us. On October 11, 2006, during the Egypt pilgrimage, the Master Saint Germain invited us to consider making a pilgrimage once per year somewhere upon the African continent to lay your feet upon the soil and to work for three solid days giving violet fire decrees and burning through deeper and deeper levels of the astral plane through the action of the light. This pilgrimage was a watershed event for heartfriends, those physically present received a special blessing given once every 10,000 years. And wherever they traveled, they were in the auric field of all of the sponsoring masters of the pilgrmage as well as the master known as the Spirit of Ghana. HeartStreams delivered during this pilgrimage. A fresh angle on Africa and a unique alchemical tool, for spiritual aspirants who desire to draw light from Heaven and into the flowfield of any African country. Nearly 10 hours of 29 amazing dictations and presentations from the 2006 Luxor Pilgrimage. • Afra Discourses During Meru University's The Master Speaks Course. Watch Afra classes #3, #7, and #11. • Find more HeartStreams from Afra and other Ascended Masters in our HeartStream Database. Join in prayers for Nigeria, Niger, and all of Africa in this video. Join live heaftstreaming vigils for Africa with the Brothers and Sisters of Afra, Sundays from 2:00-4:00 p.m. Mountain Time. Tune in from The Hearts Center home page. Through our vigils and our Afra webpage, we desire to share our passion with you for the healing of Africa. You, too, may join us in offering prayers and sending the violet light to Africa for the multiplication of the healing energies we will generate together. You may visualize the entire continent of Africa or focus on a particular country. As you become familiar with the economy, political systems, environment, and challenges within each country, your prayers can become more specific. You may focus your prayers toward changes required on the physical plane and also on the mental, emotional, and etheric levels as well.